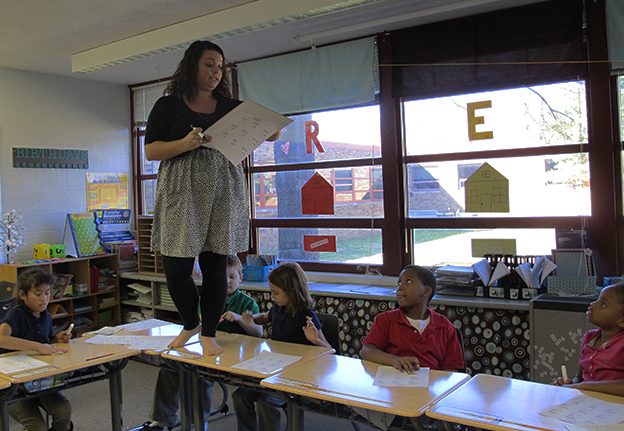 Glenwood Leadership Academy fourth grade teacher Amber Santana leads her students in multiplication drills while pacing across her their desktops. UPDATED, 5:25 p.m. EST: State education officials will step up oversight of an underperforming school in Evansville, but the efforts will stop short of state takeover. Glenwood Leadership Academy has received an F from the state for six straight years but is now working with an outside consultant to improve test scores. State Board staff and the Department of Education outreach team will step up their involvement at Glenwood, likely through increased communication with administrators. “Not only do we want the Mass Insight pieces to continue where they’ve got their changes going — because we see progress — but [we want] a lot more monitoring to be sure that it really is happening, benchmarks along the way,” says state superintendent Glenda Ritz. The state is currently overseeing five takeover schools, four in Indianapolis and one in Gary.